I was shell-shocked when I heard the news about Emiliano Sala's disappearance. The Argentinian's private plane which was set to reach Cardiff went off radars and completely vanished. Despite rigorous searches across the area where the plane vanished, the police could not find his plane or any parts of the plane. A private search funded by football superstars such as Lionel Messi, Kylian Mbappe and Adrien Rabiot was later conducted and wreckage of Sala's plane has been found now. Sometimes a bad event is what it takes to bring the best out of people. Cardiff City spent a club record £15 million fee to buy him from Nantes and were shaken by the news of the ill-fated striker. However, the players seem to have gotten a new lease of life. They seemed to have been brought together by the news of Sala and put in a respectable performance in their 2-1 defeat to Arsenal, also having an impressive 19 shots against the Emirates outfit. They continued their form and registered a 2-0 win against a Bournemouth who were fresh off their 4-0 victory against Chelsea. It is safe to say that Cardiff City have a good chance of staying up this season if they continue in this new inspired form. 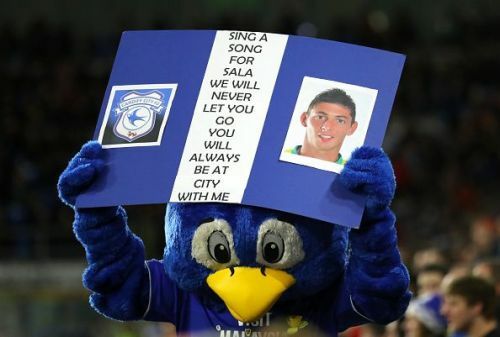 The club was hoping that Emiliano Sala could inspire Cardiff City in their relegation battle, but he was still able to inspire them in a completely different way.